This tutorial will aide you in transforming a flat design into a three dimensional packshot that is great for spicing up those product presentations. Once you’ve created a design for a product package, you may want to photograph it under suitable lighting conditions for showcasing purposes. 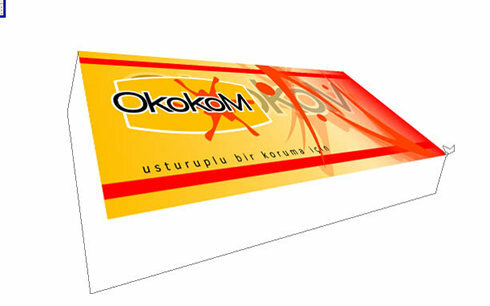 Or, you might want to skip that costly process alltogether and create a packshot in minutes. Open up your design of choice, making sure that it is on a separate layer and contains no unnecessary borders. 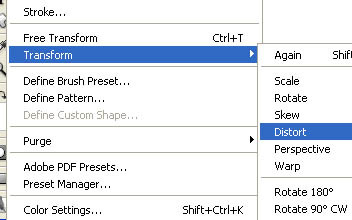 Go to Edit > Transform > Distort. 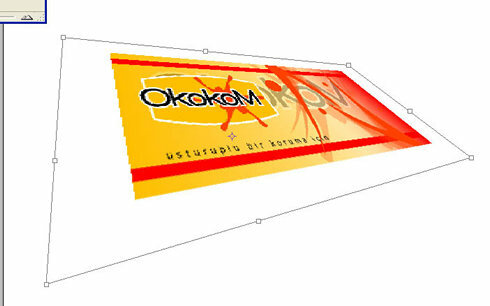 We will be applying the transformation as the initial step of creating a 3d-like image. By dragging the corners of the bounding box, shift the image’s dimensions to give it perspective. You may want to exaggerate the depth here to make for a more wooing effect. Once done, hit enter to apply the transformation. Create a new layer and drag it under the current layer. 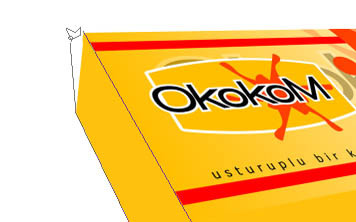 Select the Polygonal lasso tool and draw what would be the elevation of the package. This is more or less an estimate, but we are not really aiming for accuracy here. 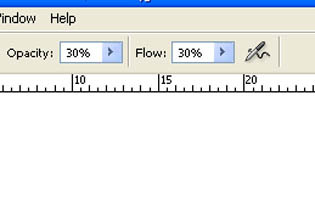 Select the fill tool, and apply a flat color. 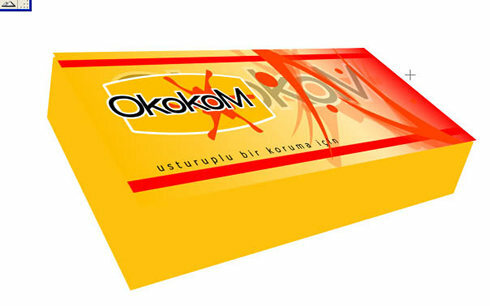 This will of course vary depeding on how you’d like the different facets of the package to print. 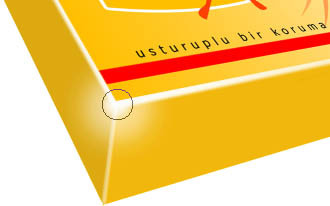 Once again, using the polygonal lasso tool, draw over the nether face of the package, making sure that the shape doesn’t overshoot the package’s dimensions. Select a slightly darker foreground color and fill the shape created with the polygonal lasso tool. This is merely done to enhance the 3-d effect. 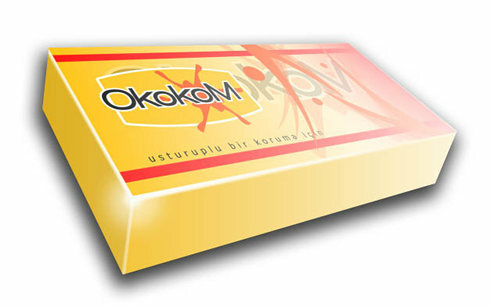 We are assuming that not all facets of the package will have the same brightness. Now, pick the polygonal lasso tool once again, and set the feather option to 3. Select a round soft brush and set both the opacity and flow to 30 %. These we are doing to give the package a slight sheen where the light would normally catch. Mask the areas you would like to lighten with the lasso tool, and gently draw in the highlight with the brush we calibrated earlier. Once done, deactivate the marquee. You can use the same brush to add something similar to a slight lens flare on the corner of the package. We will now use an adjustment layer to further improve this pseudo-lighting arrangement. 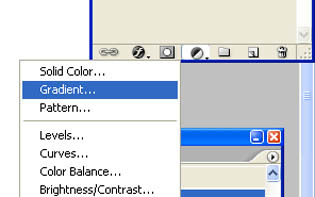 Click the adjustment layer button at the bottom of the layers palette and choose gradient. 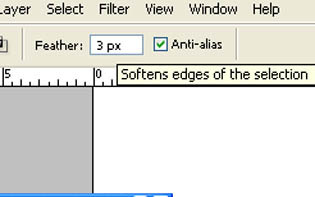 In the window that comes up, a white-to-transparent gradient will be selected by default. You may want to reverse it by checking the reverse box, depending on where you want the white to start and blend into the transparency. 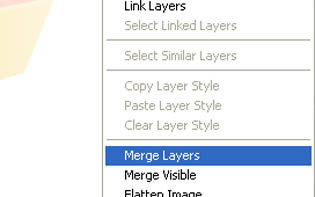 Now, merge all the layers apart from the background layer. We want the pack image to be unified so that we can apply a blending option. Select the new merged layer and bring up the blending options window by double-clicking the right side of the layer or by right-clicking and selecting blending options. Apply a drop shadow with the illustrated settings. 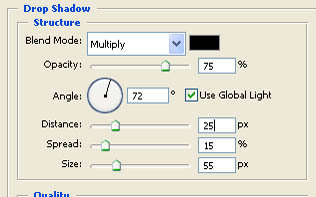 You may use different settings if you want a less intense drop shadow. And that’s about it. The image as such is on a separate layer, so it can be readily applied to a different background.